Welcome to Reader Girls. 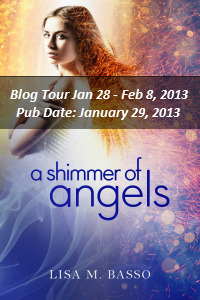 As we brace ourselves for Winter Storm Nemo, we are the last stop on A Shimmer of Angels Blog Tour. If you love stories about angels, this is a title to snap up! Our review will post later today. Author Lisa M. Basso has written a guest post for us on the angels from her YA series and there is also a great giveaway to enter. We thank Month9Books. For as long as I can remember I've had a thing for wings. So when the idea of a hero and an anti-hero came to me, I was naturally drawn to the idea of creating a few winged creatures of my own. I've enjoyed so many books about angels, both adult and YA, that my two creatures quickly became angels. The world building for A SHIMMER OF ANGELS started off based in the real world, but whenever I got to a certain part of the book, something was off. I soon realized I needed more, something deeper, unusual, and unexpected. To bring me there, I turned to my characters. When Ray, my main character, came to me in the form of a character worksheet, I was stumped. There was something she wasn't telling me. To get deeper into her psyche, I switched tactics and decided on a full-on interview. I was the reporter, she was the subject. At first she was nervous and shy, then I asked her a question about her past and BAM! Ray became so much more than the flawed character I thought she was. Since Ray is the only person able to see the angels, I wrote her story. A good deal of the world building came from her lips. But there was so much more for me to learn, so I repeated the process, first with Cam, then with Kade. The problem was there were still holes that needed to be filled in. I moved on to research, reading everything I could get my hands on, including a good deal of bible passages, jotting down anything interesting that might work in the story. Then I turned the page, locked myself in a room for several days and let my imagination run wild. The result was not magic, but a tangled mess of ideas that wouldn't make sense together. Shocking that the pieces didn't just fall into place, I know. The next few days--ahem weeks ahem--were spent sorting through everything I had, fitting and changing so much of what I had imagined and read about, creating something truly unique and solely mine. This was the point when I realized A SHIMMER OF ANGELS had to have two different worlds to work. The human world and the angels one. The human world I tried to make as real and gritty as possible. The angels world, when I looked at it from different angles, split into two very different outcomes. The angels had a shiny world of rules and hierarchies and strict order and contentment. While the Fallen had something darker, shadowed, secretive, and, most of all, deadly. Some of my favorite scenes in the book are when Ray (and the reader) experience a tiny peep hole of the worlds. Especially in the moments where all three worlds clash. I honestly can't wait for everyone to meet Ray, Cam, and Kade, and get sucked into the worlds the way I did. 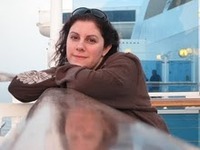 Lisa M. Basso was born and raised in San Francisco, California. She is a lover of books, video games, animals, and baking (not baking with animals though). As a child she would crawl into worlds of her own creation and get lost for hours. Her love for YA fiction started with a simple school reading assignment: S.E. Hinton’s The Outsiders. When not reading or writing she can usually be found at home with The Best Boyfriend that Ever Lived ™ and her two darling (and sometimes evil) cats, Kitties Aand B. Lisa M. Basso is available for quotes, signings, video or podcast appearances, and all opportunities relative to A SHIMMER OF ANGELS. Month 9 Books is a publisher of speculative fiction for teens and tweens… where nothing is as it seems. Month9Books will donate proceeds from each of its annual charity anthologies to a deserving charity. Individually, authors may donate his or her advances and royalties to a charitable organization. Month9Books will also release 10-12 non-charitable titles annually. A SHIMMER OF ANGELS is Month9Books’s first Young Adult release. Month9Books is distributed by Small Press United, adivision of IPG. There is a tour-wide giveaway of one A SHIMMER OF ANGELS messenger bag with a signed copy of A SHIMMER OF ANGELS and A SHIMMER OF ANGELS stainless water bottle, journal, keychain and postcard pack included in the bag. This giveaway is open to residents of the US & Canada only.